Stovesonline is a family business. We've been selling woodburning stoves and woodburners for over 35 years. Our stove experts can help you choose the right woodburning stove, we also provide installation advice and chimney design as part of our standard service. We hold a huge stock of stoves ready for a next day delivery, and can supply everything else for the installation: chimney, flue pipe, hearths and central heating components all at discounted prices. We pride ourselves on providing excellent service before, during, and after you have chosen to deal with us. We are here to help you. We can recommend a local stove installer. We offer complete after-sales support and have a dedicated stove spare parts team. Or use Search for Stoves to search for the perfect size, fuel type, or heat output. Arm yourself with information to help you make a better decision about your wood heating system using our comprehensive help and advice pages. Stovesonline will closed from Friday 19th till Tuesday 23rd of April for the Easter break. Happy Easter to all our customers. Make the most of our Spring Stove Sale. £50 Fastrack deposit to place an order over the Bankholiday and we will contact you on Tuesday to arrange delivery. Living in a city? 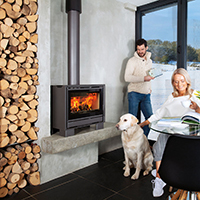 View our clean burn stoves with Smokeless Zone certification or the super efficient Eco design ready 2020 stoves. The Opus Tempo 60 Stove stove is one of many possibilities.